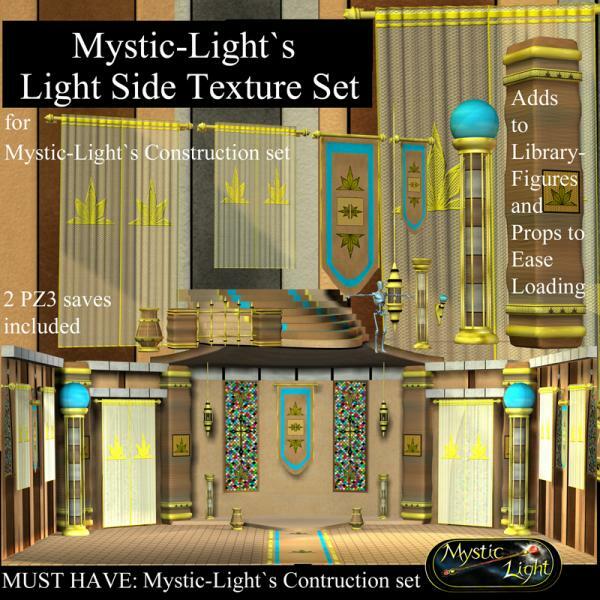 Mystic-Light presents a Texture set for Mystic Lights Construction Set, sold at Content Paradise Stores. This Texture set is one of the Lighter Sides of Castles and Props.They Dawn a Nice texture of Tans and Browns with Golden Accents to Highlight them Moments of Glory. The 2 sided steps taken ,leave You with a Great Indoor and Outdoor Look to fit the Awsome Scenes that You are about to Build.Imagine the Wonderful Garden Scene just outside the Castle or to the Great Hall of Freedom Inside. This Set of Texture has been Tested in Poser 7-8 but other programs. It's not available at CP any more. Where I can get it? giarabbit (7 years ago) Inappropriate? Deb1954 (9 years ago) Inappropriate? These are incredible. I''m new with Poser, but I''m sure all use these often.These are incredible. I''m new with Poser, but I''m sure all use these often.